Pet Beds for your furry friends are here! We carry three types of pet beds. 1. The Nest bed(donut bed) 2. 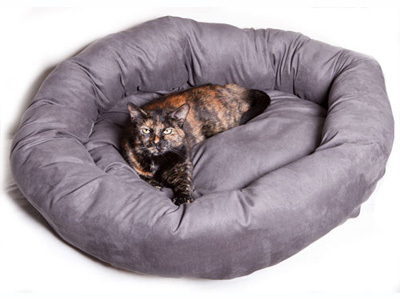 The rectangle pet bed and 3. the round pet bed. All our pet beds are handcrafted by our Futon Factory L.A. workshop here in the United States, not overseas in China. The NEST bed is shaped like a donut and is covered entirely of Microfiber fabric. It is filled with our polyester(pillow stuffing) and can be upgraded and filled with Memory Foam topper. Your furry friend is sure to love it! For cleaning, it has an insert in the tube and another insert for the center. You may spotclean Microfiber with water and handsoap,or unzip the cover and remove it for machine washing in cold water. All our wonderful pet beds can come in a wide veriety of colors. All types of our pet beds are available in 4 sizes: Small, medium, large and extra large. Custom sizes can be made too. Please call the store for price and more details.